From having to clean the usual diaper mess to spills from bottles or fun playtime in the park, parents have to come prepared always. 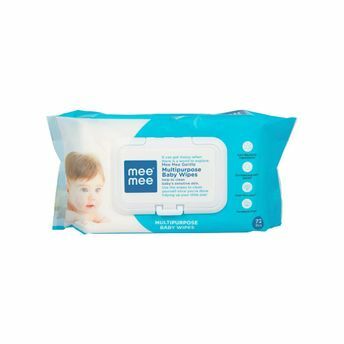 Mee Mee Multipurpose Baby Wipes act as your baby's bodyguard while they are discovering the world around. They can be easily used to wipe your baby clean and ensure complete hygiene. These wipes contain aloe vera extracts that moisturise and safeguard your baby's skin keeping it hydrated and soft. Made of thick spunlace non-woven fabric, these gentle wipes can easily clean off the mess that mealtimes tend to leave and keep your baby refreshed all through the day. Dermatologically tested, these wipes are 100 percent alcohol and parabens free. They are hypoallergenic and non-toxic to ensure that only the best comes close to your baby. They come enclosed with a resealable sticker and plastic lid that prevent the entry of germ or dirt.